Some Rain Must Fall (translated by Don Bartlett, published by Harvill Secker) takes up where Dancing in the Dark left off. Having finished his year of ‘teaching’, young Karl Ove moves up to Bergen where he is to spend a year at the prestigious Writing Academy. His brother Ingve’s presence there means settling in is fairly smooth, and with people to drink with, the start of his writing career in plain view and the beautiful Ingvild (a young woman he’s been exchanging letters with all summer) soon to arrive in Bergen, life seems pretty good. The latest translation of Knausgaard’s autobiographical novel to appear in English is another extensive slice of Norwegian angst. Some Rain Must Fall (a pun alluding both to the ‘suffering’ the writer undergoes and the almost constant precipitation in Bergen, the town he spends a large chunk of his life in) takes us from the end of Dancing in the Dark, and through some of the events of A Death in the Family, before ending with the writer’s flight to Sweden, the event which begins the period covered in A Man in Love. This one is a novel in two parts, the first focusing on Knausgaard’s year at the Writing Academy, before the second takes us briskly through more than a decade in the writer’s life, examining his gradual, painstaking route to publication, via part-time jobs, wrecked relationships and psychosis. Otherwise I sat in my seat smoking and drinking coffee, reading newspapers but no books, on the basis that it might affect my prose, that I might lose whatever it was that had got me into the Writing Academy. Humiliated in classes and unable to write at home, poor Karl Ove realises that he’s unlikely to be able to live up to his reputation as a literary Wunderkind. In fact, in the second half of the book the opposite occurs. Knausgaard makes friends with a couple of younger students, more intelligent and better read than him, who then go on to become published writers while he is still struggling to put a few pages together. Stung at the prospect of being left behind, he gradually starts to get a toehold in the literary world. It begins with reviews for magazines and newspapers, essays he writes both for courses and for himself. When he does manage to put together a story, he has occasional success, with several being included in anthologies. None of this comes easily, and the reader gets to see his first works slowly come together from painstakingly generated fragments. After his early setback with Ingvild, he manages to involve himself in a string of relationships and escapades, the bright, cheery Gunvor and the sophisticated Tonje being the women he spends most time with. As easy as he finds it to get together with these women, though, the emptiness inside him prevents him from making it work. He wants a stable relationship, but his destructive personality means he deliberately sabotages what he has, always looking for ways out (but too afraid to sever the ties himself…). Particularly in the first part of the book, there’s a palpable sense of novelty, with everything seeming new, and so important. Anyone who went to university away from home will recognise the enthusiasm Karl Ove has for his new life, and the mix of excitement and trepidation he’s almost drowning in. However, one of the effects of this enthusiasm on the book is that every event is given exaggerated importance. Every woman is the girl of his dreams, every setback is the end of his writing career, and the reader feels his anguish in the writer’s words, even twenty years after the fact. Yet twenty pages later all is forgotten, with new girls coming along and fresh literary embarrassments just around the corner (which can be rather annoying for the reviewer trying to put their finger on the main events of the novel!). 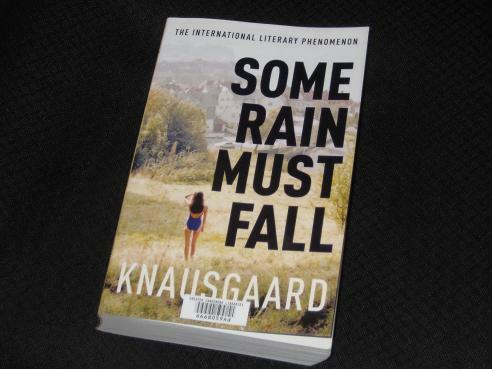 Because of this, there are times when Some Rain Must Fall feels like a simple page-turner. It may be entertaining to read, compelling in a train-wreck sort of way, but the writing isn’t always that impressive, at times trite, even. On reflection, though, there’s a sense that this is largely deliberate, the mature writer allowing himself to regress to this stage in his life, choosing a style that suits the Karl Ove of the time. Certainly the style (to me, at least) appears to improve as the book progresses, the later parts more complex, more introverted, reflecting the development in Knausgaard’s abilities as he returns to university and attempts to make up for lost time. It’s now that we see the real writer emerge, reading voraciously and becoming obsessed with his self-education. Part of the charm of this episode of Knausgaard’s life is also the contrast between the good and bad sides of his character (Karl Ove Jekyll and Knausi Hyde), with the sinister alter-ego always only a few bottles of wine away. He’s a man who accepts people for who they are, loves to discuss poetry, works hard, cares for his grandmother, always living in the shadow of Ingve and his absent father. He’s also the man who, when drunk, sleeps around when he gets the chance, attacks his brother and rages through the night, waking up under bushes, in hallways, horrified the next day by memories of what he said and did. Early on he’s every bit as immature and clueless as he was in Dancing in the Dark, but what makes Some Rain Must Fall stand out from what was easily the weakest book in the series is his growing realisation of the fact and the increasingly pathetic and inexcusable nature of his actions. What’s funny when you’re nineteen is sad when you’re pushing thirty, and Karl Ove realises this better than anyone, terrified of ending up a pitiful, lonely has-been (he only has to look at his family for a glimpse of a possible future…). I had my doubts at times that this one would manage to live up to the heights of the first two in the series, and early on it certainly didn’t seem that way. However, by the end Knausgaard had me hooked – it took me five days to read the 663 pages of my version, and I knocked off the last two-hundred pages on that fifth day. You can’t help but be swept along by the sheer energy and honesty of his writing, the way he lays bare his emotions and his honest description of the joy of being young and in love… I can’t wait for the sixth and final instalment of My Struggle, even if I have no idea how he’ll manage to finish the book off (surely we know everything there is to know about him by now?). I’m looking forward to this next installment. Melissa – Me too 🙂 I was a bit disappointed by the last one, but this one made up for it, especially the second part. Get writing, Don! Sharkell – Thanks 🙂 It’s not for everyone, and I suspect you’d find out very quickly if you’re likely to enjoy it. The good thing is that if you do, you have another 2000+ pages left to read! Great review as always. About 90% of the way through myself and it is definitely a return to form after Book 4. I guess Book 4 was necessary in his life story but the head of a self-important 18 year old isn’t really a particularly interesting place to spend 548 pages. Fascinating to see how the successful author emerges from the fumbling attempts of the 20 year old student. Overall my favourite since Book 1. Book 6 is I think something of a monster in size, but given the author himself hardly spends much time polishing his word choices I would imagine it is easier to translate than many novels of a third of the size. As I understand it, Book 6 is where the novel becomes “self-aware” i.e. we hear about Knausgaard’s life as the author of My Struggle, as well as a rather lengthy digression on the original writer who had a book with the same title! Paul – This one is third of the five so far for me, albeit only just behind the first part (Part Two is easily my favourite so far). I also enjoyed the development of Knausi as a writer – the only problem is that his debut work *still* hasn’t been translated into English as far as I’m aware (his second book has and is excellent…). Yes his debut hasn’t. and that is a shame as I suspect would be fascinating to compare that to the development of the novel here. Oddly the 2nd novel was a bit too much about literature for my taste, or rather about too much about the minutiae of literary life rather than books. As someone from a mathematical background I love literary books but the life of the artists behind them isn’t of real interest at all (one reason why I’m firmly in the “leave Ferrante alone” camp). You mention the “creepy parallels between Knausgaard’s experiences and my own” – have to say I don’t identify with his life and experiences in the slightest, yet still enjoy the novels. Fair enough. I sometimes find even writing my goodreads review creates a little bit of pressure. I’ve only got as far as the first three – not a deliberate decision, just other books in the way (of course, as the volumes are often quite long they do require an investment of time that might allow for two or three other books!) I’m beginning to wonder of I should just wait until they are all translated now. Grant – No, I’d set aside some time later this year, setting yourself up for when Part Six comes out (I’m certainly very keen to try it as soon as it’s available…). One day I will have to give book one another. go. It was one of those enjoyed it until I put it down then never felt the urge to pick it up again experiences. I expect to find it in a used bookstore sometimes soon. What I read was excellent, just too much book for me at the time. Being born in the same year as Knausgaard, worryingly I identify more with his musical tastes than his, rather more refined, literary ones. “I’m only making plans for Nigel” and “Senses Working Overtime” echoed in my head as I read – albeit these were released in the years Karl Ove (and I) turned 11 and 14 – but can’t say I was struggling with Claude Simon in my early twenties.